Guess what? 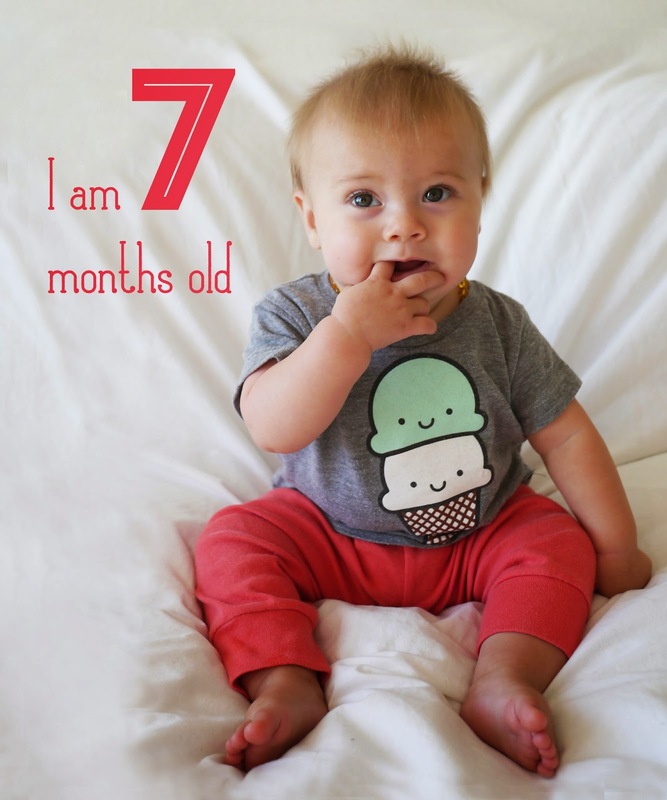 I am now seven months old! Over the last month I have been learning lots of new things and brushing up on skills I've previously learned. I'm getting super fast at crawling, I can wave, I can feed myself from a squeezy apple sauce pouch, I'm learning to drink out of a sippy cup, I can climb over (and on top of!) all sorts of stuff, I'm good at pulling myself up to standing against furniture and people, I've been practicing lowering myself down from standing, and I can stand on my own for a few seconds. I'm pretty proud of that last one. It always makes me smile. I've been practicing talking and I try hard to copy Mummy. I can now say "Mama", "Dada", "Lala" (Lola) and "Vava" (Ava). I babble all day long - when I'm not blowing raspberries that is. I love blowing raspberries! I've been taking swimming lessons with Mummy at the YMCA for almost a month now. I absolutely love being in the swimming pool - there's so much water to splash! We sing songs, blow bubbles, practice floats, play with duckies and pool noodles, practice climbing out, and go under the water a lot. Mummy is proud of how well I go underwater. I don't get upset at all. Sometimes I swallow a little bit of the pool water and cough when I come back up but usually I'm pretty good at holding my breath. Now that I'm a super fast crawler I like exploring our apartment. I really like watching clothes spin in the washing machine. That's my favourite thing right now. It's so mesmerising! I also like grabbing at stuff on tables, especially food or games that Ava and Lola are trying to play with. I like pulling all of the freshly cleaned washing out of the washing basket. I like to pull the DVD player down from the tv cabinet and sit on top of it (I've done that so many times lately that I broke the DVD player and Daddy had to buy a new one!). And I love to sit on Mummy's lap and bash at the keyboard when she's trying to typey7.ft rd luop, nghbnn vbu0 There I go! I really don't like staying still at all. I wouldn't stay still while Mummy was trying to take these photos. In fact, I thought it was pretty hilarious to crawl off the edge of the bed! It's a big drop from the top of a pillow top ensemble to the ground but I managed to "climb" down without hurting myself a few times. Mummy kept stopping me. She's no fun! I don't have any teeth yet but I love chewing on things so I'm sure they will be coming through soon. My fingers are my favourite thing to chew on but I also like my Sophie Giraffe and my wooden California teether. Actually, I like chewing on anything I can get my hands on. And I like big hugs. Here's a hug for you.